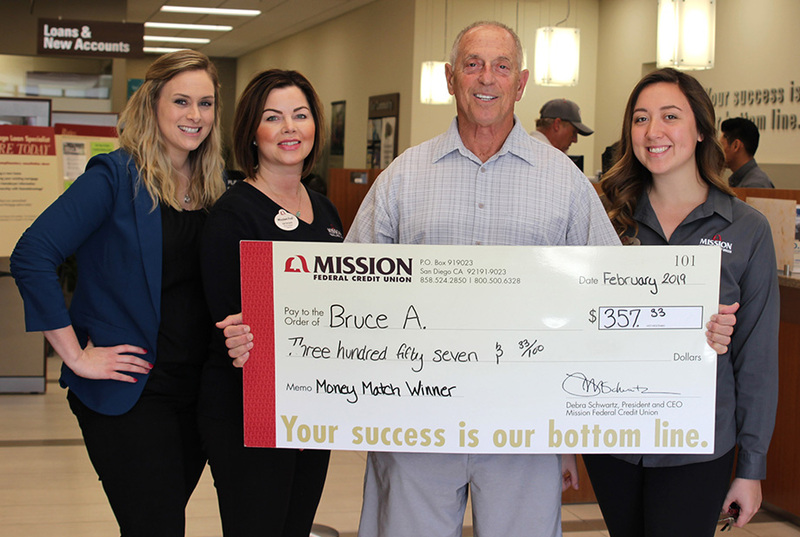 Bruce A. knows the banking team he can count on: Mission Fed Encinitas Branch! A retired school teacher and member of more than 20 years, Bruce was excited to win an Auto Loan Money Match in the midst of his newest home renovation project. 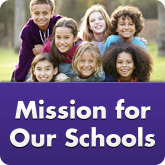 Thank you for supporting our community and Mission Fed! 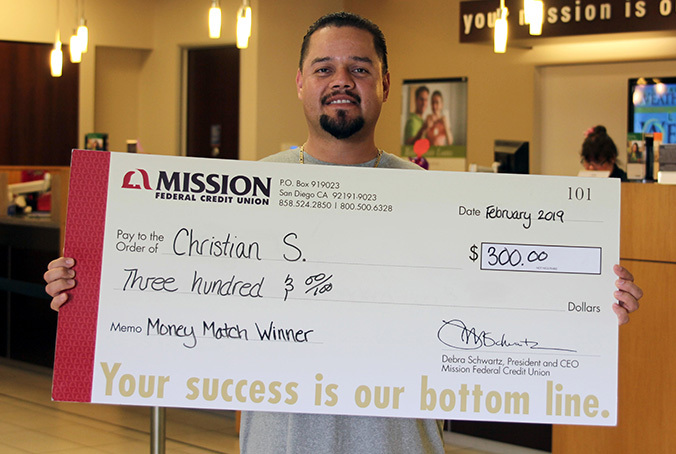 Christian S. did what any good dad would do after winning an Auto Loan Money Match: he took his family on a trip! Thank you for your membership, Christian, and we hope you enjoyed Great Wolf Lodge. 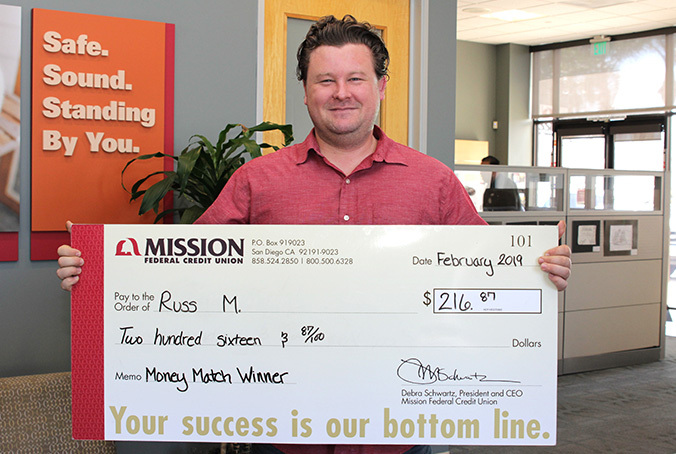 Russ, a USD Grad Student, couldn’t believe he won a $1 Million Mission Fed Money Match. He plans to make an extra car payment—way to go! 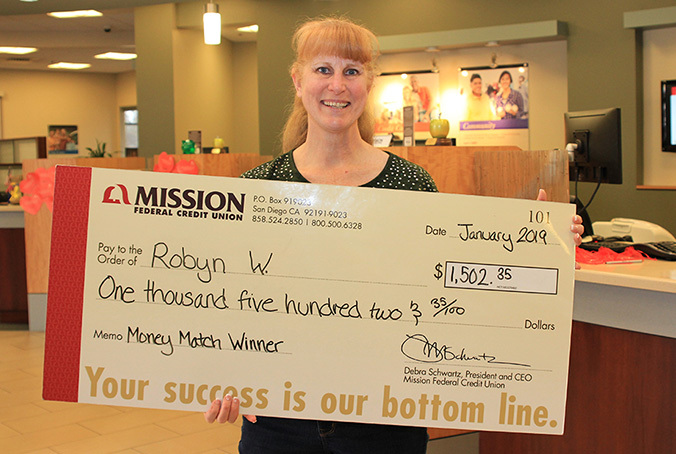 Robyn W. has big plans for Direct Deposit Money Match win: a trip to Disneyland! We’re thrilled to be a part of your day at the happiest place on earth. 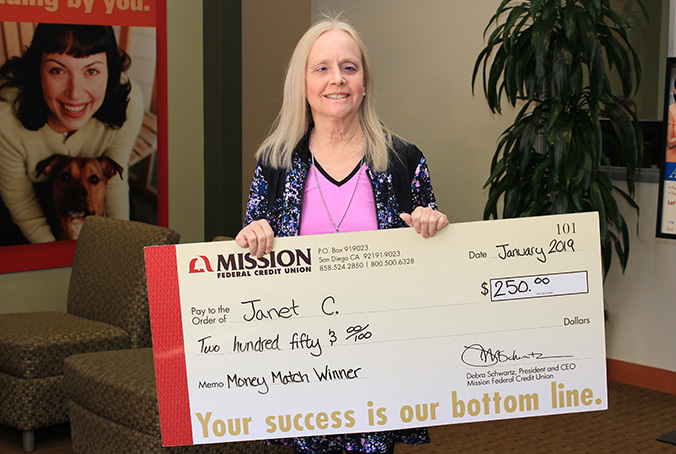 Janet C. was excited to learn she had won a $1 Million Mission Fed Money Match for $250! As a longtime member, it was our pleasure to thank her for your membership with this token of appreciation. 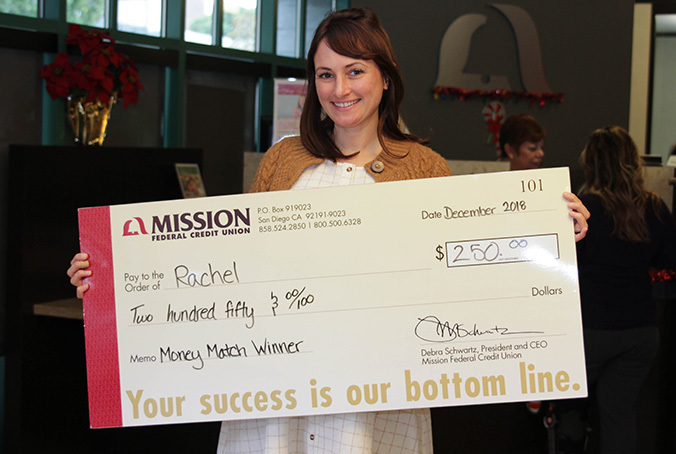 Rachel was happy to win a Credit Card Purchase Money Match of $250. 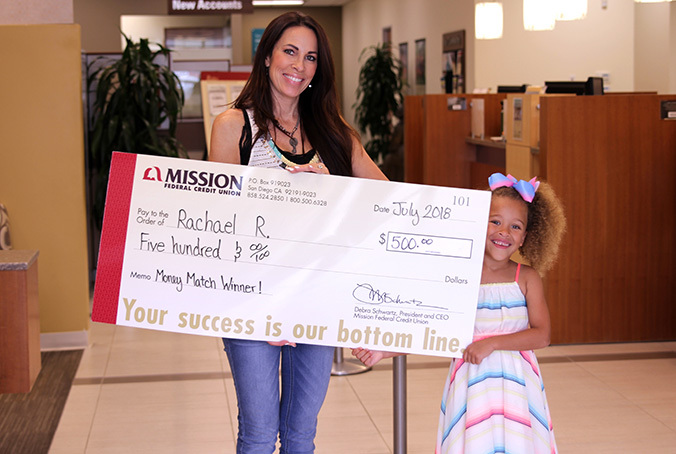 Rachel used the extra funds to help with a surprise event and build her savings. Congratulations and thank you for your membership, Rachel! 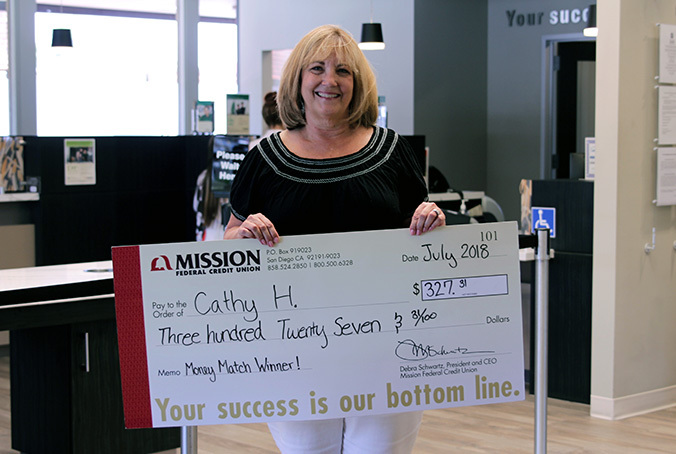 Longtime member, Cathy B., was delighted to win a Credit Card Purchase Money Match of $250. She used the extra cash to purchase a ticket for her son to fly to Napa and visit friends—what a great mom! 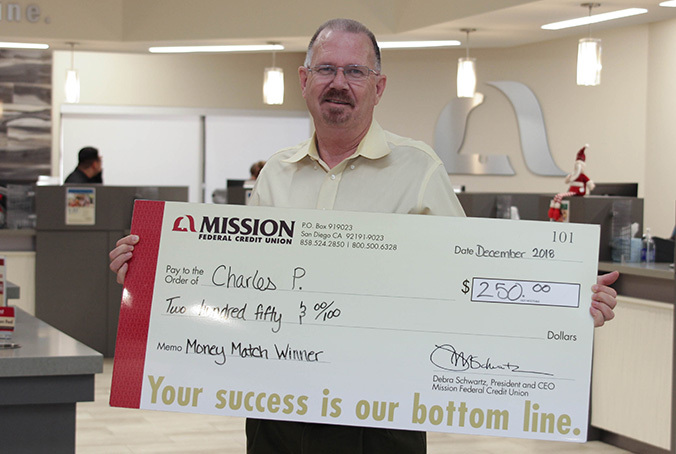 Charles P. knew just what to do when he found out he won a Credit Card Purchase Money Match of $250: spend it holiday events and gifts for loved ones! Congratulations, Charles and thank you for being a member. 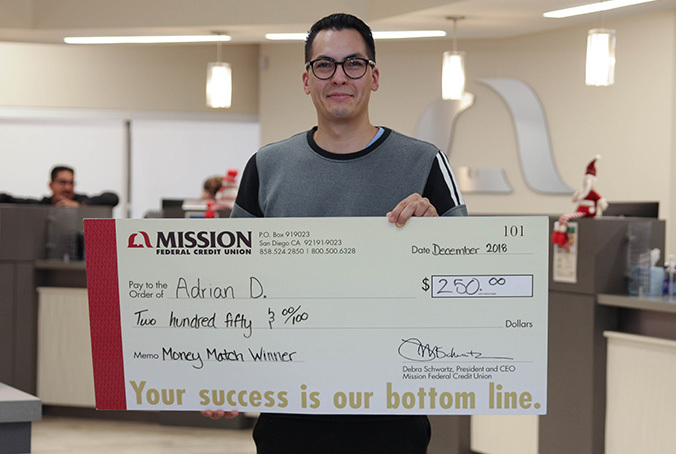 Mission Fed member, Adrian D., couldn’t believe he won a Credit Card Purchase Money Match of $250. He plans to make an extra credit card payment and treat himself to something small—now that’s smart! 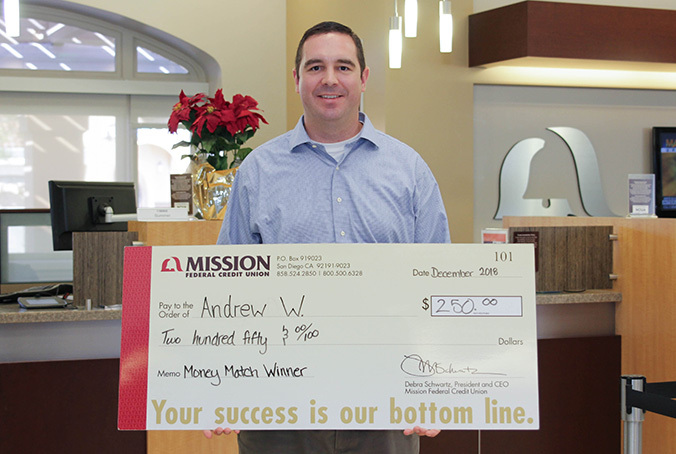 Andrew W. won an Auto Loan Payment Money Match of $250, and in his words, “It couldn’'t have come at a better time.” Congratulations, Andrew! 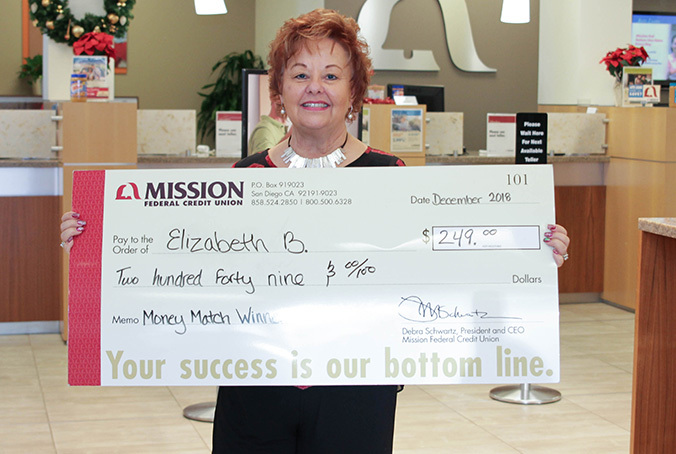 Mission Fed member, Elizabeth B. and her husband, were flabbergasted to find out they won a Credit Card Purchase Money Match of $249! They intend to use the winnings toward festive fun on their cruise in 2019. 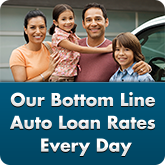 Jean B. was thrilled to find out she was an Auto Loan Payment Match winner, just in time to make the final payment on her car. 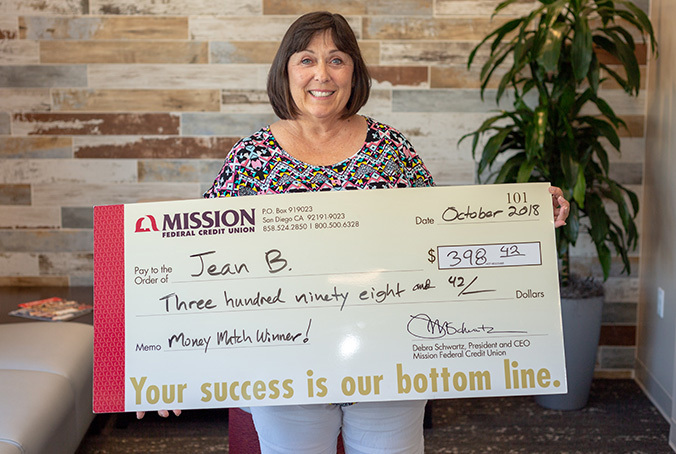 We think it’s safe to call that a win-win for Jean. Congrats! 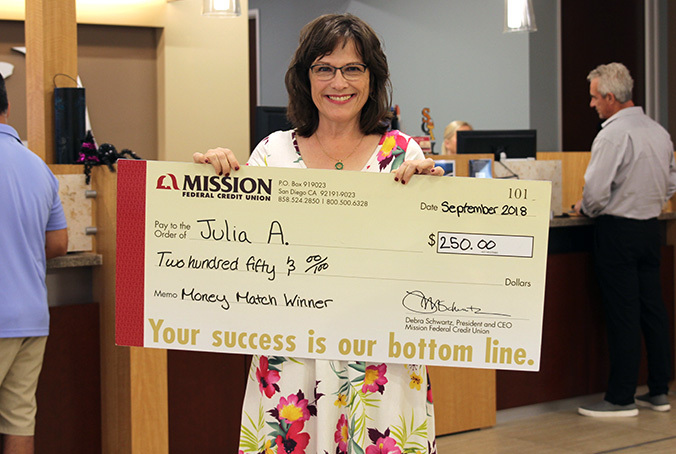 Mission Fed Member, Julia A., enjoyed spending her Credit Card Purchase Match while on her first cruise off the Pacific Northwest last month. The cruise was a gift from her daughter and son-in-law for being a wonderful mother and grandmother. Great job, Julia, and we’re glad we could make your cruise even more special. 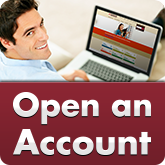 Evelyn and her husband were so excited to discover an unexpected Direct Deposit match in their account in August. And the timing couldn’t be better since they ARE expecting an addition to the family in just a few months! 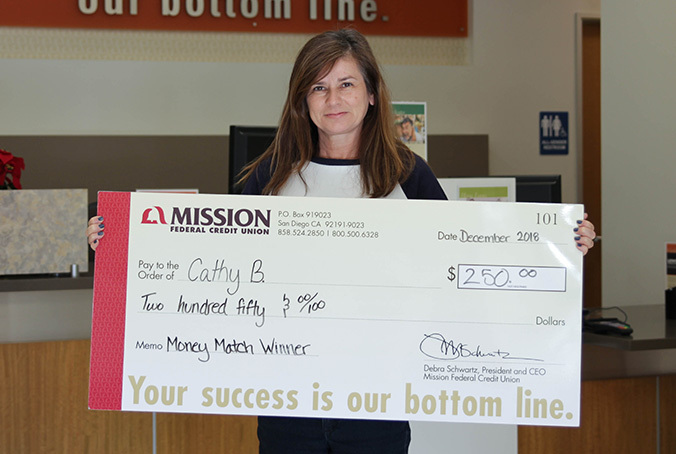 Kristin S. couldn’t believe it when she won a Credit Card Purchase Money Match! The match ended up being the perfect excuse for her to treat herself to some new jewelry, just because. 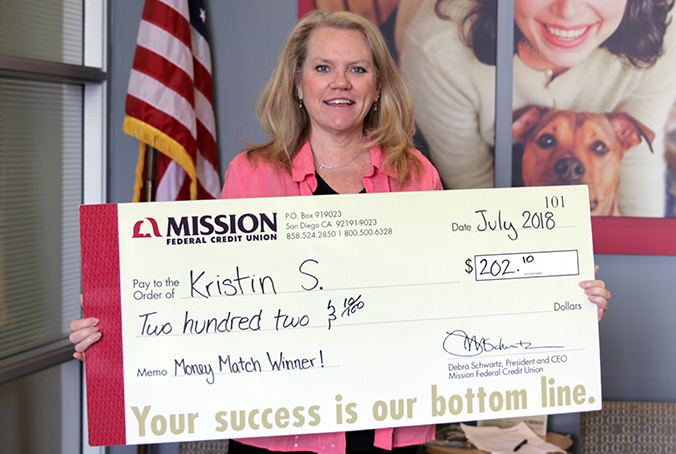 Congrats, Kristin! Rachael R. and her daughter Gracie, had a great day celebrating Gracie’s 6th birthday with shopping, the movies and posing for their Auto Loan Payment Money Match! Rachael is planning an over-the-top birthday party this weekend to celebrate her sweet girl. 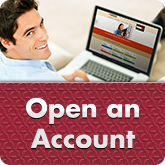 Monica M. was pleasantly surprised to be a recent Home Loan Payment match winner. 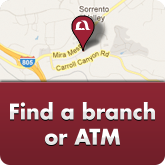 She even visited the branch to make sure the deposit was correct! She’s thrilled for the extra money in her account and plans to use it not only to pay down some loans, but also to enroll in tap dancing lessons, which she has always dreamed of doing! 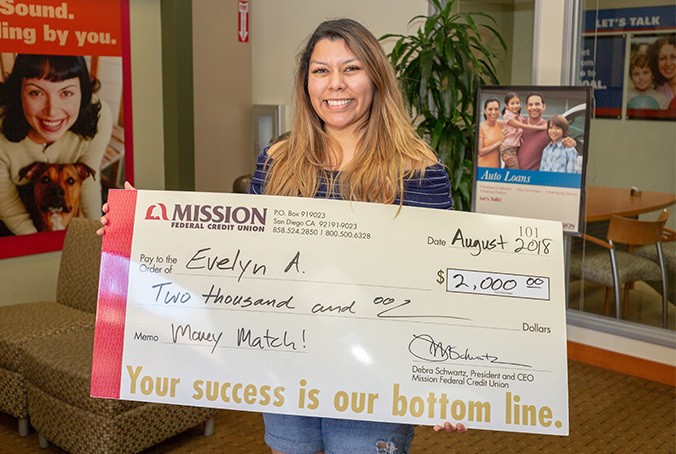 Randall and his wife Erica are longtime Mission Fed members who were happy to win a Home Loan Payment Money Match as they prepare to send their daughter off to college. 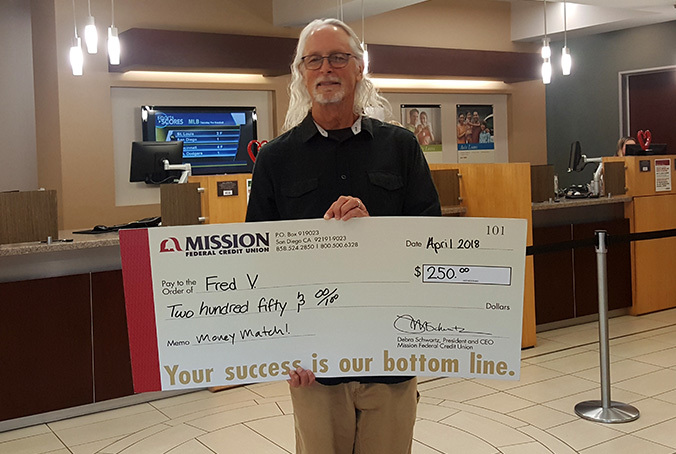 Fred V., recent $1 Million Mission Fed Money Match winner, couldn’t believe the news. He and his family were excited to receive the extra funds and plan on treating their daughters. 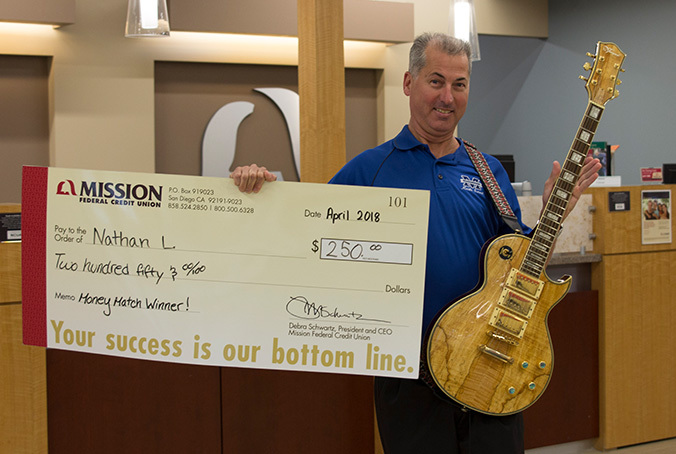 Nathan L. from Poway is an old school rocker and a Mission Fed member who recently who a Credit Card Purchase match of $250. He knew just what to do with his extra cash—treat himself to a new awesome guitar—which he insisted he be photographed with! Following his photo shoot, Nate serenaded the Poway Branch with John Lennon’s “Imagine,” which put a smile on everyone’s face. 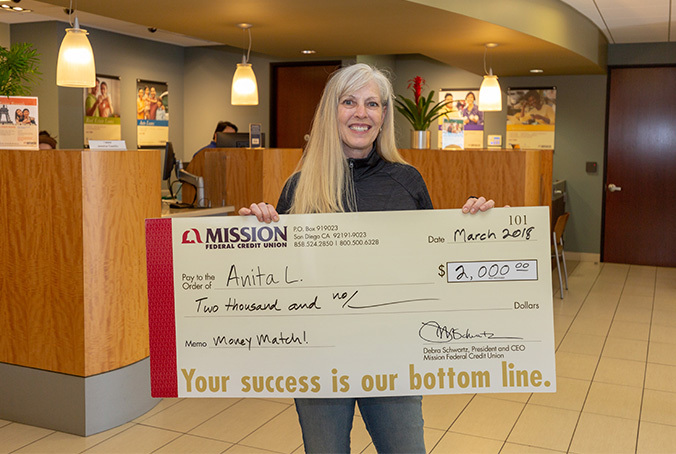 Anita L. can no longer say “I never win anything!” after we matched her Direct Deposit up to $2,000 in March. 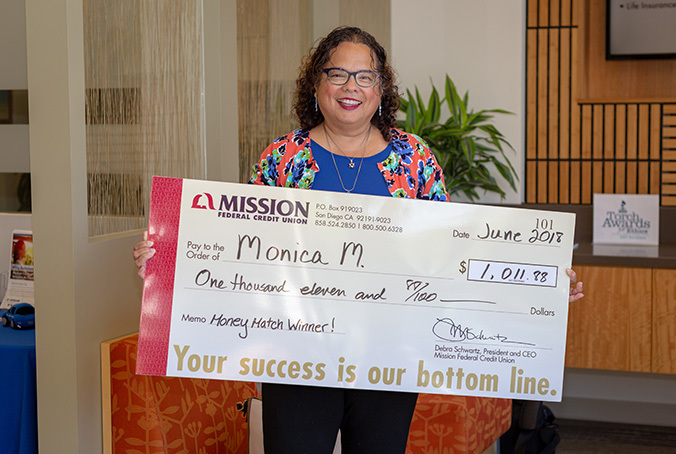 As a long-time member, she is thrilled that Mission Fed does so much to thank its customers. 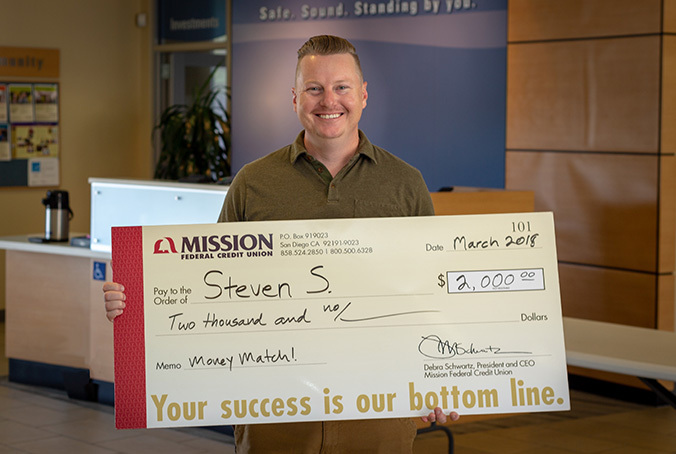 Steven S. had to do a double-take and check the math on this match of $2,000 on a Direct Deposit, which he mentioned came just in time for tax season. Congratulations to all who have won so far—we look forward to giving many more members great news this year!